Logitech is to unveil Google TV goodies this week, beating Sony to the punch. Sony was always touted as being the first to market with a Google TV product – the new internet TV platform – but it seem that Logitech will reveal its new kit 6 October, where it will show off "its line of products for Google TV." This is before Sony officially announces its Google TV devices. It's not all bad news for Sony, however, as Logitech is more likely to show off an accessory range (including a remote control) and a set-top box that incorporates Google TV. 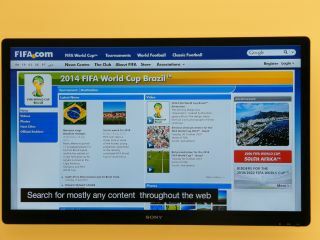 Sony is set to launch a web-connected television with Google TV inside. Logitech says that Google TV is "a new experience that combines TV, the entire web and apps – as well as a way to search across them all." It is hoping to "enable seamless control" for this service. Bringing the Android app market to television is an interesting move by Google. The ability to access the web through your TV will put Google TV in direct competition with YouView, the UK-based set-top box which will bring web content alongside Freeview content.